ASCO-SITC, San Francisco · 2019, T. Y. Seiwert et al. Background: Despite proven efficacy, a limited number of patients (pts) with recurrent/metastatic head and neck squamous cell carcinoma (HNSCC) or metastatic non-small cell lung cancer (NSCLC) benefit from anti-PD-1 treatment. Indeed, most pts do not respond to initial therapy due to intrinsic re-sistance to checkpoint inhibition. There is thus an important unmet medical need for a curative treatment in these pts and converting the local immune microenvironment to a “hot” phenotype may help to overcome therapeutic resistance. Hafnium oxide nanoparticles (NBTXR3) activated by radiotherapy (RT) increase radiation dose de-posit within cancer cells compared to RT alone. Recently, a phase II/III randomized trial of NBTXR3 in locally advanced soft tissue sarcoma (STS) met primary and main secondary endpoints with sig-nificant superiority compared to RT alone [NCT02379845]. Furthermore NBTXR3+RT demonstrated an immunogenic cell death-mediated abscopal effect in a pre-clinical setting, and immune cell infil-tration was observed in some tumors from STS pts treated with NBTXR3+RT but not in tumors from pts treated with RT alone. NBTXR3 is currently being evaluated in 7 clinical trials, including a phase I/II study in elderly frail patients with locally advanced HNSCC [NCT01946867]. To date, no early dose limiting toxicities (DLTs) have been observed. 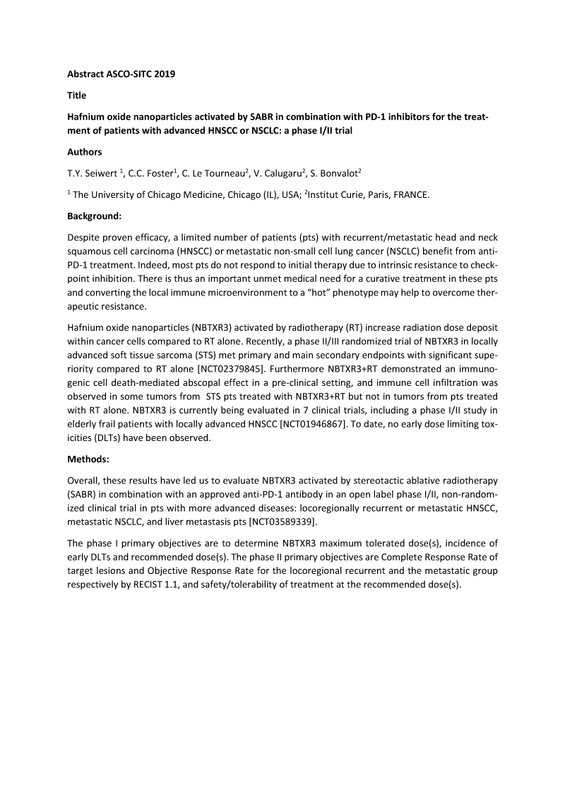 Methods: Overall, these results have led us to evaluate NBTXR3 activated by stereotactic ablative radiothera-py (SABR) in combination with an approved anti-PD-1 antibody in an open label phase I/II, non-randomized clinical trial in pts with more advanced diseases: locoregionally recurrent or metastatic HNSCC, metastatic NSCLC, and liver metastasis pts [NCT03589339]. The phase I primary objectives are to determine NBTXR3 maximum tolerated dose(s), incidence of early DLTs and recommended dose(s). The phase II primary objectives are Complete Response Rate of target lesions and Objective Response Rate for the locoregional recurrent and the metastatic group respectively by RECIST 1.1, and safety/tolerability of treatment at the recommended dose(s).